Access to deep-seated brain lesions with traditional fixed and rigid brain retractors can be difficult without causing significant trauma to the surrounding brain. Tubular retractors offer an advantage of low retracting pressure. We developed a new inexpensive and simple tubular retractor which requires very small cortisectomy. The new tubular retractor was made up of silicone with inner diameter of 15, 18 and 23 mm and outer diameter of 17, 20 and 25 mm, respectively. This tube (1 mm thick) was cut in longitudinal direction. It was folded to make a small-diameter tube so that it could be introduced through a small cortisectomy. Margins of cortisectomy were gently and slowly retracted by Killian nasal speculum. Folded retractor, held by tissue forceps, was introduced inside the opened Killian nasal speculum. Tissue forceps and nasal speculum were removed leaving tubular retractor in place, which comes back to its normal tubular configuration after release. Surgery was performed using rigid Karl Storz 0° telescope (30 cm long and 4 mm in diameter) or microscope. Near-total removals of intracerebral hematomas, 37 hypertensive and 3 traumatic, was done using this retractor without any complication. Deep-seated supratentorial intraparenchymal and intraventricular brain lesions can be difficult to access without causing significant trauma to the surrounding brain. Traditional brain retractors use multiple blades, which do not exert equally distributed pressure and thus are traumatic. Complications like hemorrhagic infarct or contusions are reported with the use of such retractors in the region of exposed brain. ,, Most of the present retractor systems are fixed and rigid. Sometimes these retractors create glare in the microscope that distracts the surgeon. Tubular retractors offer an advantage over the conventional retractors. ,,,,, The low retracting pressure around a tubular retractor is not likely to be as disruptive as is the pressure in conventional retractor systems. Although different types of tubular retractors are available, ,,,,,, they have their own limitations. We describe a new tubular retractor which is easy to apply, inexpensive, requires small cortisectomy and is safe and effective. This is a prospective study of 40 patients with hypertensive/ traumatic basal ganglionic hematomas with or without intraventricular hematoma treated during a 2-year period from January 2008 to December 2009. The study was approved by the ethics committee of our institute. Written consent was obtained from all the patients or their legal representative. A detailed history, a thorough physical examination and all relevant investigations were performed in all the patients. Hematoma evacuation was done in the initial 10 patients using a microscope with the help of a 23 mm inner diameter tubular retractor. 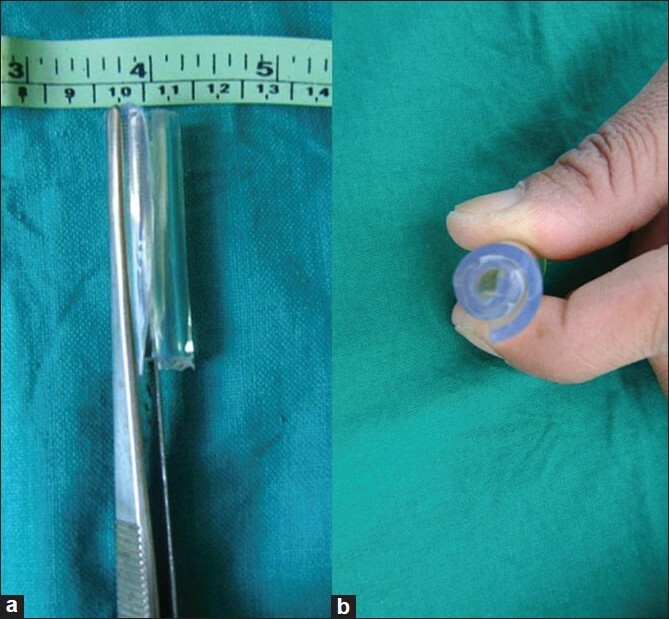 Tubular brain-retractor size was reduced to inner diameter of 18 mm and 15 mm in the next 10 and 20 patients, respectively; and Karl Storz 0΀ rigid scope 30 cm long and 4 mm in diameter was used to remove the clot in subsequent patients. Patients were evaluated postoperatively by computerized tomography (CT) scan on the first postoperative day in all the patients, and subsequent scans were done as and when needed. Any brain contusion or infarctions and the amount of hematoma removal were recorded. Straight incision of 4-6 cm was made under general anesthesia. Dura mater was opened in circular fashion after reflecting bone flap. The silicone tubular retractors were pre-cut to different sizes of 5, 6, 7 and 8 cm. Sterilized tube of about 30 cm length was also kept ready, and it could be cut to the required size on the table. Small cortisectomy of 6-9 mm was made to reach the hematoma. Part of the clot, which came out spontaneously through the small cortisectomy, was sucked out. 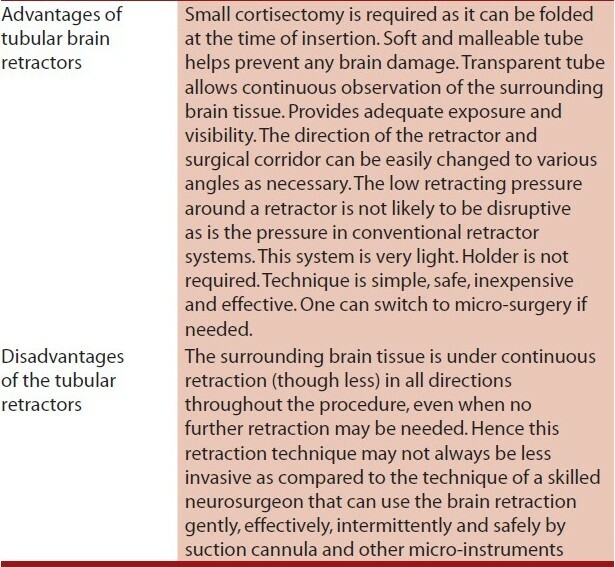 Silicone tube with 15, 18 and 23 mm as inner diameter and 17, 20 and 25 mm as outer diameter, respectively, was used as a brain retractor [Figure 1]a, b. This tube can be obtained from almost all medical instrument manufactures and companies such as Himedia and Tarsons. The tube used was 1 mm thick. It was cut in longitudinal direction [Figure 2]a and b. 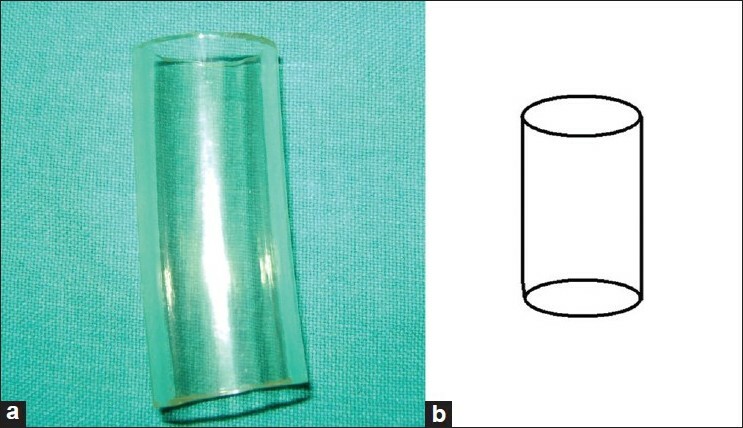 It was folded to make a small-diameter tube so that it could be introduced through a small cortisectomy [Figure 3]a and b. Margins of cortisectomy were gently and slowly retracted by Killian nasal speculum [Figure 4]a. Folded retractor, held by tissue forceps (one limb of forceps outside and another inside the retractor as shown in [Figure 3]), was introduced inside the opened Killian nasal speculum [Figure 4]b. Tissue forceps and nasal speculum were removed leaving tubular retractor in place [Figure 4]c. Folded retractor comes back to its normal tubular position after release. Its normal tubular configuration can be restored by gentle outward pressure on retractor by two micro-instruments such as suction cannula and dissector. Surgery was performed using microscope or 30 cm long and 4 mm in diameter 0Ί telescope (Karl Storz GmbH and Co.,Tuttlingen, Germany). Telescope with its sheath was then fixed using a holder. Both the hands could be used for evacuation of hematoma with the help of suction cannula, biopsy forceps and other micro-instruments. Bipolar coagulation was used for hemostasis. Proper vision and good magnification were possible in all the cases. Transparent nature of the tube helped in better visualization of the surrounding brain tissue. Bleeding from the cortisectomy margin was controlled while the retractor was gradually withdrawn. This retractor should be autoclaved. It could also be sterilized by activated dialdehyde solution (Cidex solution) or by ethylene oxide (ETO) sterilization. A total of 40 patients with hypertensive/ traumatic basal ganglionic hematomas treated during the period from January 2008 to December 2009 were studied using tubular retractor. Re-application, if needed, was equally easy. Follow-up period ranged from 3 to 27 months, with an average of 16 months. Duration of surgery ranged from 60 to 110 minutes, with an average 90 minutes. Near-total removals of hematomas were done in all the patients without any complications such as contusion or infarcts. Advantage of our retractor is that the cortisectomy required is small. Longitudinal cut reduces outer diameter of our retractor to half at the time of insertion. It is capable to retract even tight brain. The tubular retractor is transparent, lightweight and versatile, can be moved in any direction, avoids time wastage in repositioning and a holder is not required. Soft and malleable tube helps prevent any brain damage. The technique is simple, safe, inexpensive and effective [Table 1]. One can switch to micro-surgery if needed, although larger-size tube is required as compared to endoscopic technique. The present trans tubular micro endoscopic approach is an alternative to traditional brain retractors and other cylindrical retractors. Limitations of this study are the small number of patients and that it was used in hematoma removal only. Study with large number of patients and its use in tumor excision is required to validate the present study findings. A new tubular retractor system for deep brain lesions is readily available, simple, effective, lightweight and inexpensive. Use of this system minimizes cortisectomy size and avoids retractor-induced trauma to overlying brain. The new retractor with such ease of application seems to be an advantageous alternative compared to the conventional retractors. The tubular retractor is transparent, can be moved in any direction, is versatile and avoids time wastage in repositioning. Our system does not require any holder. 1. Fahim DK, Relyea K, Nayar VV, Fox BD, Whitehead WE, Curry DJ, et al. Transtubular microendoscopic approach for resection of a choroidal arteriovenous malformation. J Neurosurg Pediatr 2009;3:101-4. 2. Rosenørn J, Diemer N. The risk of cerebral damage during graded brain retractor pressure in the rat. J Neurosurg 1985;63:608-11. 3. Singh L, Agrawal N. Stitch retractor-simple and easy technique to retract brain. Surg Neurol. 2009, Aug 5 (Epub ahead of print). 4. Thiex R, Hans FJ, Krings T, Sellhaus B, Gilsbach JM. Technical pitfalls in a porcine brain retraction model. The impact of brain spatula on the retracted brain tissue in a porcine model: a feasibility study and its technical pitfalls. Neuroradiology 2005;47:765-73. 5. Greenfield JP, Cobb WS, Tsouris AJ, Schwartz TH. Stereotactic minimally invasive tubular retractor system for deep brain lesions. Neurosurgery 2008;63:334-9. 6. 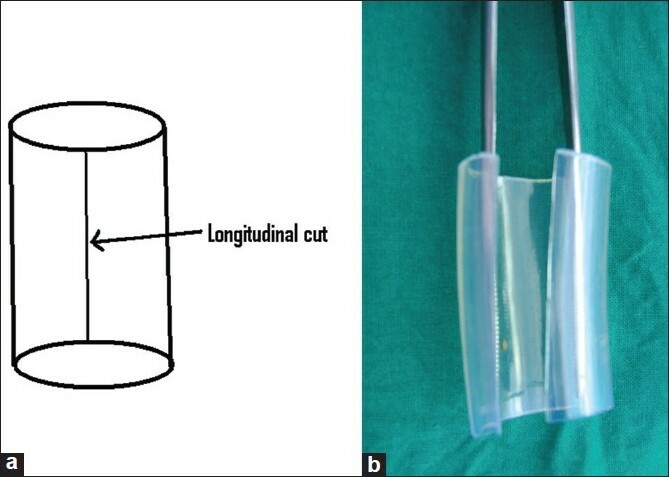 Singh L, Agrawal N. Cylindrical channel retractor for intraventricular tumour surgery--a simple and inexpensive device. Acta Neurochir (Wien) 2009;151:1493-7. 7. Ogura K, Tachibana E, Aoshima C, Sumitomo M. New microsurgical technique for intraparenchymal lesions of the brain: transcylinder approach. Acta Neurochir (Wien) 2006;148:779-85. 8. Cabbell KL, Ross DA. Stereotactic microsurgical craniotomy for the treatment of third ventricular colloid cysts. Neurosurgery 1996;38:301-7. 9. Ross DA. A simple stereotactic retractor for use with the Leksell stereotactic system. Neurosurgery 1993;32:475-6. 10. Ichinose T, Morisako H, Goto T, Takami T, Ohata K. Microroll retractor for surgical resection of brainstem cavernoma. Surg Neurol. 2009, Aug 5 (Epub ahead of print). 11. Nakano T, Ohkuma H, Ebina K, Suzuki S. Neuroendoscopic surgery for intracerebral haemorrhage--comparison with traditional therapies. Minim Invasive Neurosurg 2003;46:278-83. 12. Nishihara T, Nagata K, Tanaka S, Suzuki Y, Izumi M, Mochizuki Y, et al. Newly developed endoscopic instruments for the removal of intracerebral hematoma. Neurocrit Care 2005;2:67-74. 13. Yadav YR, Mukerji G, Shenoy R, Basoor A, Jain G, Nelson A. Endoscopic management of hypertensive intraventricular haemorrhage with obstructive hydrocephalus.BMC Neurol 2007;7:1. 14. Barlas O, Karadereler S. Stereotactically guided microsurgical removal of colloid cysts. Acta Neurochir (Wien) 2004;146:1199-204. Mandel, M. and Amorim, R. and Paiva, W. and Prudente, M. and Teixeira, M.J. and de Andrade, A.F. Yadav, Y.R. and Sachdev, S. and Parihar, V. and Namdev, H. and Bhatele, P.R.